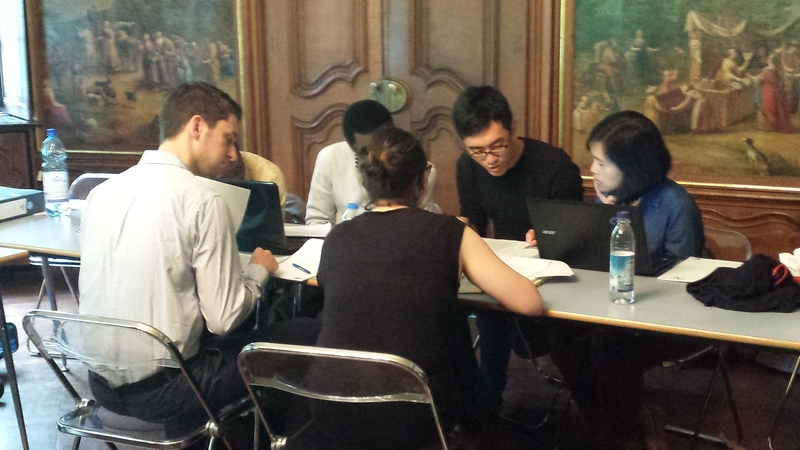 Here are some of our #Graines2018 (Twitter) impressions from the Sciences Po, Reims campus, 6-8 June 2018. Reims may have a cathedral, but the Sciences Po campus is a cathedral in its own right. Here we go: With Jakob Vogel introducing Global Europe. And straight into Kapil Raj’s (EHESS) keynote – Calcutta, dogs, alcoholics…fascinating world. And over to the students: 5-7mins speedy, punchy presentations. Ok, global-transnational Europe…gimme a break. We are also here for coffee, are we not? Over to Natalie Scholz (University of Amsterdam) for her keynote. Research into local food culture, yummy! Gluten here we come. Marketa Krízová (Charles University) taking us to early Latin America and European missions…and utopia. On behalf of all participants, we would like to thank the Science Po team around Jakob Vogel and Thomas Gauchet for organising and hosting our 5th Graines Summer School at the beautiful Sciences Po campus at Reims, 6th to 8th June 2018. 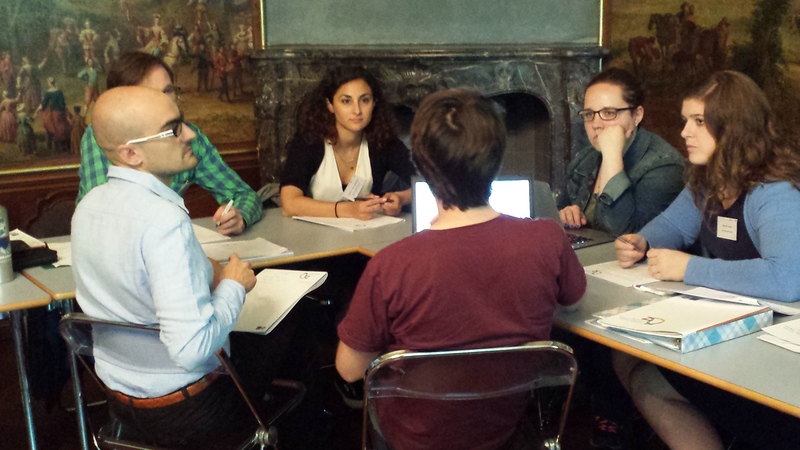 Our summer school on “Global Europe. 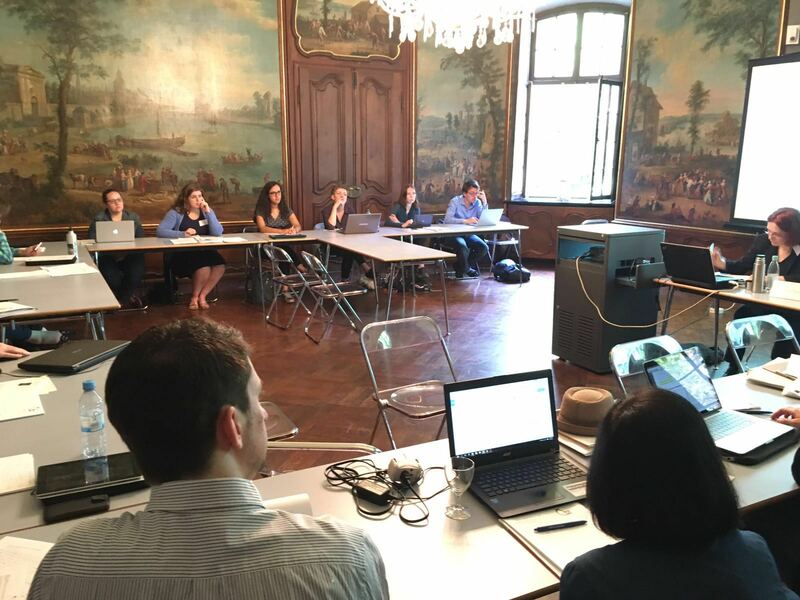 Connecting European History (17th to 21th Century) brought together some 30 scholars – staff, Master students, PhDs, postdocs – from Poland, Czech Republic, Austria, USA, Turkey, Germany, France, Macedonia, the Netherlands, Italy, the UK, and Switzerland. For 2.5 days we discussed themes, topics, and readings ranging from colonial encounters in 18th-century Calcutta, to versions of maritime history, early modern European missions and visions of Latin America, to “Eurafrica” and colonial as well as transnational connections to migration history and the globally connected village. Formats ranged from keynotes to reading groups, 5-mins speed-presentations by our PhDs to a sprint-pair-writing session on aspects that had arisen from discussions. The programme can be found here: GRAINES 2018 Programme Summer School. My PhD project seemed well defined before arriving to GRAINES summer school. My intention was to extract differences and similarities between Irish, Welsh, Scottish and Breton revivalist groups participating in Pan-Celtic Congress, and their approach and reasoning about Celtic Identity as label or tool, within the context of their goals. It should have been “classical” comparison, studying each of the groups more or less separately. However, discussions and the whole topic of the venue (Global and Transnational Historical Approaches) made me think not only about the interconnections between these groups, individual actors, but also external influences. I’ve realized that by applying this perspective I will be more likely able to formulate the aspects that influence the social group representation, and to see through the motivations of each of these groups or individuals. Microhistorical and transnational approach in combination with comparison could be a good starting point. Global and Imperial History, increasingly seen as overlapping, have been hotly discussed in recent years and its popularity among historians only seems to be growing. As a consequence, more and more attempts are coming up to specify the exact workings of such global and imperial connections. One of them is the article Global History, Imperial History and Connected Histories of Empire by Simon J. Potter and Jonathan Saha. We both think this could revolutionise our understanding of such connections. We will illustrate this with our respective projects. Imperial violence in the fin de siècle period was ubiquitous and took very similar forms in many different empires, be they British, German, Dutch or otherwise. Write a paragraph or two on ANY point of interest from “Global Europe” – a text, a point of discussion, what you learned, what you would like to share with others, which idea you take home… OR write the first page of your PhD! ‘After the digital turn’ – the title of the GRAINES Summer School 2017 in Basel, Switzerland evoked images of a path into a new, largely unknown world, full of potentials and perils. It simultaneously conjured open doors in front and impenetrable walls behind every researcher – the death of the traditional historian, the birth of the digital historian. Scholarship has turned digital, there is no way back – but: is this true and do we like it? (When) is it useful to employ digital methods? What is the effect of using digital methods? And, parallel to the inherent problem of a historian’s work – quantity versus quality – the underlying question of limits, time costs, and frustration. While many participants arrived with relatively set ideas as to their approval on digital humanities – ranging from “the next logical step in scholarship” to “I am more than sceptical” – every individual researcher allowed themselves and others an open discussion in which positions were repeatedly questioned, and even avid proponents of digital methods raised concerns and doubts as to their use and value. As indeed, what is the use of a database that collects information just because it can? What is the use of a map that merely illustrates, a graph that adds nothing but colour to the written word? And how sustainable is our research in an ever-changing technical environment? On a personal note, I arrived as someone feeling humbled by the seemingly endless opportunities of digital humanities, with a fear of technologies that seemed to require a completely different training than I had received. I left Basel as someone who supports the potential of digital methods, with a much more positive interest in employing new technologies than ever before. Why? Because I realised that despite all the very real issues with digital methods (from ethical questions to the sheer amount of tinker time necessary to master the technical skills) they are simply a new way of doing our familiar work as historians. At best they open new ways of asking questions that a conventional approach might not uncover. At worst they waste time and energy in pointless activity without meaningful results. Databases ease the collection of data and allow for new quantitative approaches but they cannot select or answer our questions. Maps have been a selective representation for centuries, they do not change their inherent characteristics just because pencil becomes pixel. Digital methods require critical engagement with both the techniques and the results. They require the skills every good historian has been trained in from the start of their studies. The trick to leave the fear behind and start to see the chance seems to be the realisation that a historian’s work still first and foremost happens in his mind – and that skill is open to everyone. The GRAINES Summer School for 2017 introduced a topic that for most historians is both exciting and confusing. The way historians have interacted, used and abused digital methods has tended in two directions. The first, a caution or fear of the unknown. Historians feel that they cannot learn the skills that are required to make best use of the digital humanities or they simply refuse. The second, is with open, uncritical, arms of the miracle technology that will eventually save the Historian’s Craft. The line between the two positions seems thin and difficult to walk. However, this Summer School did a perfect job of it. The workshops, discussions and project led sessions were critical, engaging and informative. Sessions designed to teach showcase new skills, such as GIS or database software, did not just uncritically present their digital packages as one-size-fits-all deals, or as black boxes in which one could place their research questions and magically find them answered at the other end. Instead, they made us critically engage with the digital turn and to reflect upon why and how we use certain methodologies. One of the most important messages to take away is that the digital humanities must be subject to the same critical criterion of any historical methodology. Additionally, the digital humanities is not a device we can use to answer every question, instead it is useful only so far as we make it useful. A database for the sake of a database is nice but runs the risk of becoming nothing more than a pretty toy. The project related sessions added a more personal touch and an excellent space to show the benefits of the digital humanities for a diverse range of specific topics or to air one’s concerns or struggles with these new methods. It was also a chance to showcase a wide range of tools that could, potentially, be of use to the historian and how they may go a certain way to answering research questions, or even of creating new ones. From a personal perspective, I came to Basel having tried many of the digital methods and exploring their possibilities in relation to my topic. 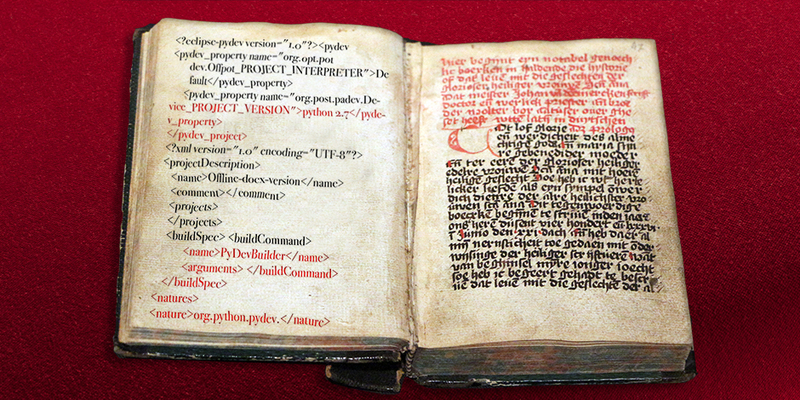 More often than not, I came away frustrated and unsure of what the digital humanities could offer me. However, after this intensive week of discussion and discovery I feel that I should give the digital humanities another chance. The help I have received has reinvigorated my desire to retry techniques, apply them in new ways and to ask different, more critical, questions of my method. In the winter of 1884/85 representatives of 11 European countries as well as the Ottoman Empire and the United States met in Berlin to discuss and decide the future of the African continent. It was not the first time European powers laid claim on vast territories far from their own. Spain and Portugal had already done so in 1494 when they signed the treaty of Tordesillas, and since then European and a few non-European countries had asserted their economic, political and/or cultural influence over large parts of the world. Nevertheless, the Berlin Africa Conference marked the height of the age of imperialism and until today epitomizes how a small number of powers divided the world amongst them. It also serves to remind us that the modern age was to a large extent shaped by empires and imperialism. Imperial History has always stressed the importance of empire for the development of modernity. However, until recently scholars have focused mainly on typical colonial empires such as Spain, Portugal, France, the Netherlands, Germany and most notably the British Empire. The study of continental and/or non-European empires like Russia, Austria-Hungary, the Ottoman Empire, the United States, China or Japan has not been neglected but undertaken mostly in separate scholarly fields. Besides that, the age of imperialism has often been regarded as a mere transitory period in the rise of the modern nation state. During the last years, though, globalization and the end of the Cold War have sparked a renewed theoretical and empirical interest in political formations beyond the nation state. Antonio Negri and Michael Hardt reintroduced the concept of empire to describe post-modern political phenomena. Historians like Ulrike von Hirschhausen and Jörn Leonhard focussed on the age of imperialism instead, but compared maritime and continental empires. Others, like Jane Burbank and Frederick Cooper, included different types of empires in the same analytical framework. And Ann Laura Stoler and Carol McGranahan questioned the usefulness of “empire” as an analytical frame altogether. They suggest studying imperial formations, which include settings that are not part of empires, but characterized by imperial conditions like flexible borders, heterogeneous populations, a lack of legitimacy from below, legal inequalities and civilizing missions. Thus the scholarly field of imperial studies has broadened beyond European maritime empires and the age of high imperialism. 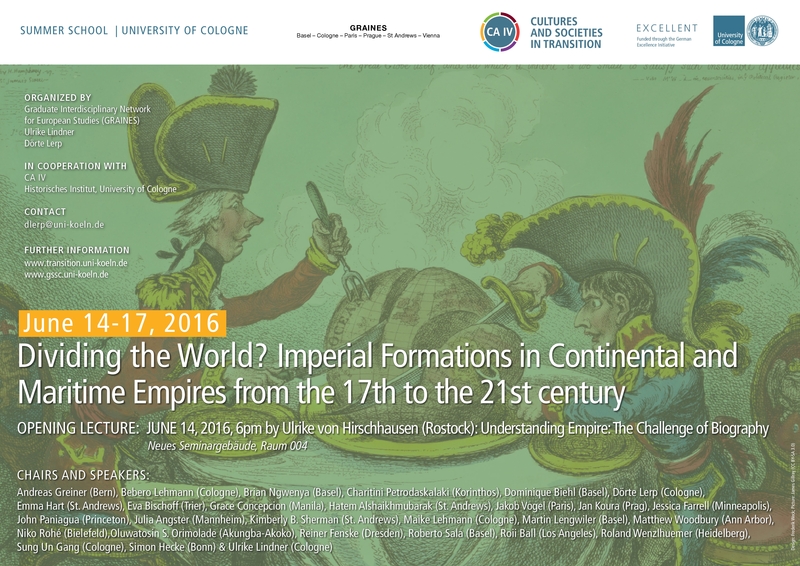 Based on this broad approach the GRAINES Summer School 2016 will take a closer look at imperial formations in continental and maritime empires from the 17th to the 21st century. We will focus on various forms of empires and imperialism, be they European or non-European, capitalist, socialist or fascist, modern, early modern or post-modern, territorial or non-territorial. During our seminars, reading groups and lectures we will discuss the similarities and differences between those settings and how imperial formations can be approached from various disciplinary and methodological standpoints. • How do we define imperial formations? What is the relationship between imperialism and colonialism? What distinguishes or links states, nations and empires? • Are there specific forms of imperial rule? What constitutes them? How are they legitimized? Where and when do they produce resistance or resilience? • Are there specific imperial forms of belonging and citizenship within imperial formations? How is difference produced? What role do intersecting dimensions of race, class, gender, nationality etc. play in this process? • How are imperial formations organized spatially? Do they have centres and peripheries, borders, boundaries or frontiers? What is the relationship between different spaces of empire? How are they produced? • How did imperial formations reshape practices of consumption? Did empire effect trade, production and processing? What perceptions and imaginations of imperial economies existed? • When and where do imperial formations compete or cooperate? Do they exchange expertise and people? Is there a transfer of imperial practices and discourses? Which concepts do they borrow, adopt or adapt and which are discarded? • How are imperial formations represented (through maps, photographs, museums and exhibitions, literature, films, video games…)? 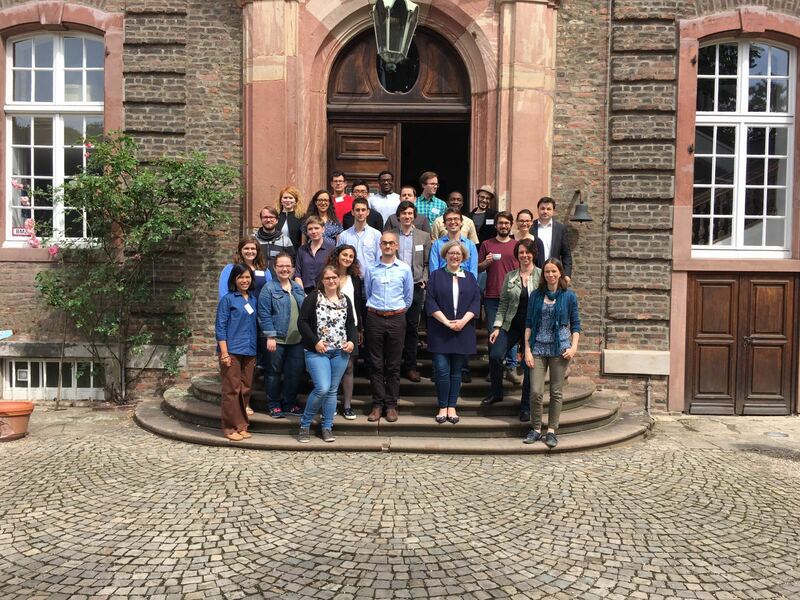 The summer school is organised by the Graduate Interdisciplinary Network for European Studies (GRAINES) in cooperation with the University of Cologne and the Global South Studies Center (Competence Area IV). The program includes reading and discussion groups, lectures and excursions, as well as room for the presentation and discussion of student projects. While the summer school will have a distinct interdisciplinary and trans-epochal character, potential participants should demonstrate historical awareness and general interest in history. We invite postgraduate students from a broad range of theoretical perspectives and disciplines to submit their project proposals to the organisers. The working language of the summer school is English. Accommodation costs will be covered, a limited number of travel bursaries may be available. To apply, please send your project proposal of maximum 1000 words and a one-page CV by 15 March 2016 to Dörte Lerp at dlerp@uni-koeln.de.